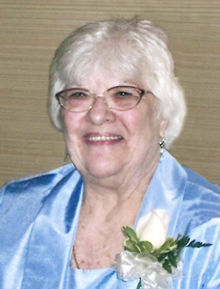 Smith, (Chiodi) Antonette 'Toni' of Revere formerly of East Boston passed away on April 6th. Loving wife of the late James Smith Sr. Devoted mother of Lawrence Smith of Revere, James Smith Jr and wife, Desiree of Revere, Rose Smith of East Boston and the late Leona, Anthony and Patricia Smith. Cherished sister of Lawrence Chiodi of Plymouth, Rose Woodside of East Boston, Eleanor Lamonica of East Boston, Katherine Spagnola of Revere, Salvatore Chiodi of East Boston and the late Pauline Paolini, Andrew Chiodi, Francine Imbrescia, Ann Magner and Anthony Chiodi. Dear grandmother of 8 grandchildren and 9 great grandchildren. Family and friends will honor Antonette's life by gathering at the Ruggiero Family Memorial Home, 971 Saratoga Street East Boston 02128, on Wednesday April 10th from 4:00PM to 8:00PM and again Thursday morning at 8:30AM before leaving in funeral procession to Immaculate Conception Church Revere, Ma for a 10:00AM funeral mass. Services will conclude with Antonette being laid to rest with her husband at Woodlawn Cemetery, 302 Elm Street Everett 02149.